Editor’s Note: Lei Zhang is the U.S. general manager for CocoaChina, which operates the largest iPhone developer community in China. The company also has a game publishing arm called Punchbox Studios, which has seen more than 70 million downloads for its hit Fishing Joy — primarily in China. The ﬁrst quarter of 2012 saw smartphone shipments to China surpass shipments to the U.S. for the ﬁrst time, but which devices are people in China actually using? iPhones have carved out a signiﬁcant portion of the market share among Chinese smartphone users, but what about the fragmented Android market? What devices are Android users in China using? If you’re thinking of expanding your mobile app into China, there are important things to consider before entering this particular market. Even though my company CocoaChina is based in China, it has had to face a number of challenges unique to the local marketplace. We’ve gathered some data from our own title, Fishing Joy, which garnered over 70 million downloads on iOS and Android platforms, to give you a sense of the type of results you can expect to see in China. Apple officially entered the Chinese smartphone market with the iPhone 4, ﬁrst through a partnership with China Unicom and later with China Telecom (with the iPhone 4S). Developers targeting a strictly Chinese userbase have an advantage because of the reduced number of iOS devices to worry about. By not supporting older models of iOS devices (due to their negligible presence), China-focused developers can concentrate on delivering features for high-end devices and minimize development and QA-related efforts. 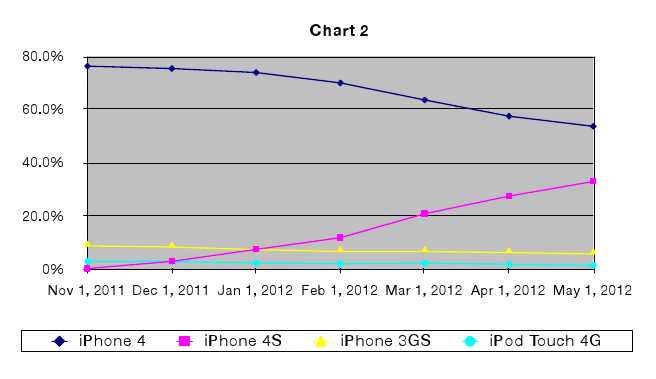 The following chart, based on PunchBox Studios’ Fishing Joy downloads, indicates that a majority of Chinese iPhone users are on the iPhone 4 series, with very few on older hardware. We can easily see a 54 percent market share for iPhone 4 and 33 percent for iPhone 4S, with a very rapid adoption rate of the latter. Clearly, the iPhone 4 is driving Apple’s smartphone strategy in China. With Apple’s long-awaited partnership with China Mobile, the largest wireless carrier in the world, probably on its way, one should expect more impact from Cupertino in 2012, moving towards winning the largest smartphone market share globally. In the Android playing ﬁeld, we can clearly see the rise of domestic handset manufacturers with Android devices. The following charts compare the top devices for a casual, all-ages game, measured by Fishing Joy’s quarterly game sessions, in Q4 2011 and Q1 2012 respectively. For developers considering pre-install deals with hardware makers in China, watch out for the rapidly changing device landscape and the rise of local manufacturers. On a side note, though pre-installation is often considered the Holy Grail for app distribution, the conversion rate in the Chinese market is typically around 30 to 40 percent. Last but not least, on the tablet side iPad takes the lead with more than 50 percent of the market share, though signiﬁcantly lower than its lead in the global market, with local manufacturer Lenovo taking the second spot, according to iResearch. Chinese Internet companies are entering the competition by expanding their businesses into producing hardware. Search engine, Baidu, recently launched a low-cost smartphone that will run Baidu’s own operating system. Baidu currently operates 80 percent of the search market share in China and has been working to prevent Google from getting a foothold in China. Baidu’s new phone has the potential to have a big effect on China’s highly competitive smartphone market. Priced at 1,000 RMB ($156.80), Baidu’s phone is entering a market range fought over by hundreds of domestic phone makers. On the high-end market currently dominated by Apple, Samsung and HTC, watch out for Qihoo 360, another Internet giant winning in the the anti-virus and desktop browser market, which is partnering with Huawei to create a high-end smartphone that will battle with other established players and startups (such as Xiaomi) for cost performance. CocoaChina will be paying attention to future trends and taking note of which phones are beating the competition. Developers should keep their eyes open so they’re ready to create the best apps for the phones their users are actually using.